Think it's about time I updated? Yipe...k, been over 3 months since I posted ANYTHING.. *baps self* I should have updated this long ago, but I've been too busy working. I finally have something to show for all these months reworking my Enterprise-E though. 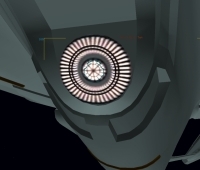 I finally have the upper saucer looking decent, and movie-like (took me this long to figure out how to make all those hull plates on the surface without drawing every single one...). First order of business is the Seafire... multiple people have reported that the .shp file for it doesn't seem to work, and I don't know quite why. But I've decided to fix that, and a few other things all at once. I've reworked the Seafire using a more refined model, and fixed a few of the bugs. Version 2.0 is now available for download on the Custom Opts page. 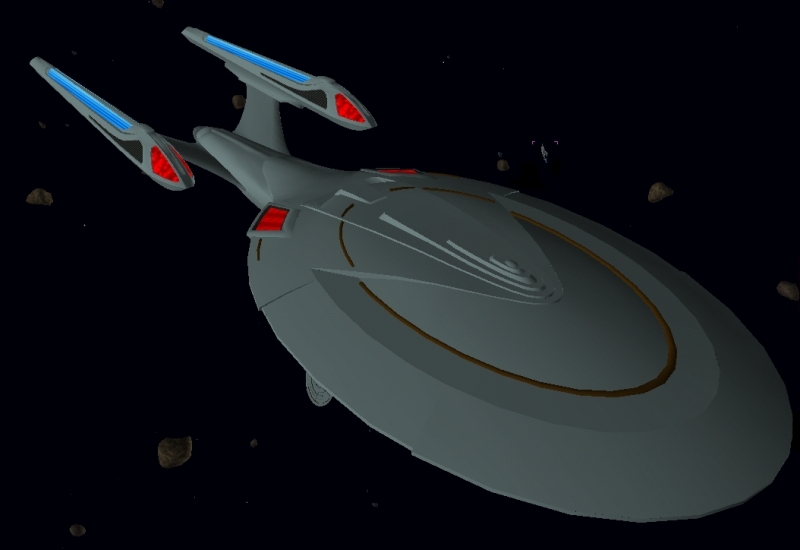 Second, as visible from the pic above, I reworked the TOS Enterprise as well, remodeling it, etc, and it's near ready to be uploaded. Version 2.0 of that will go up sometime this week. Third, It may be a while, but I've got a brand new design ready for testing. I'm calling it the Hawkbat for now, and it fits.. 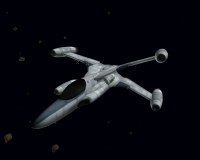 Currently, it's only a cockpit-less exterior opt, but I will make a cockpit for it someday. 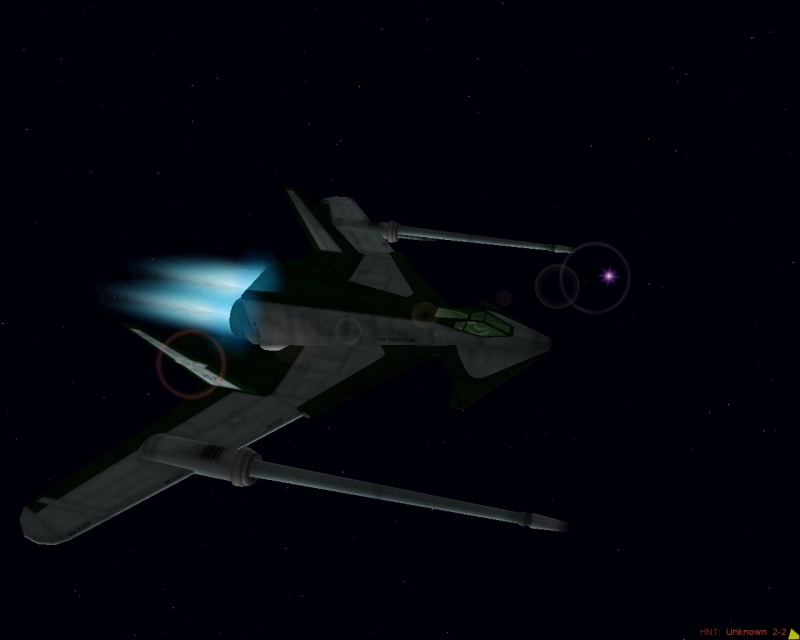 My only wish is that TG had put these kind of lighting effects in XWA.....Sadly, the spotlight and specular maps will have to be removed for the opt. Okay, the good news is, I'm not dead. The bad news is that in the last two months I haven't actually finished anything. But I have done a lot of work. 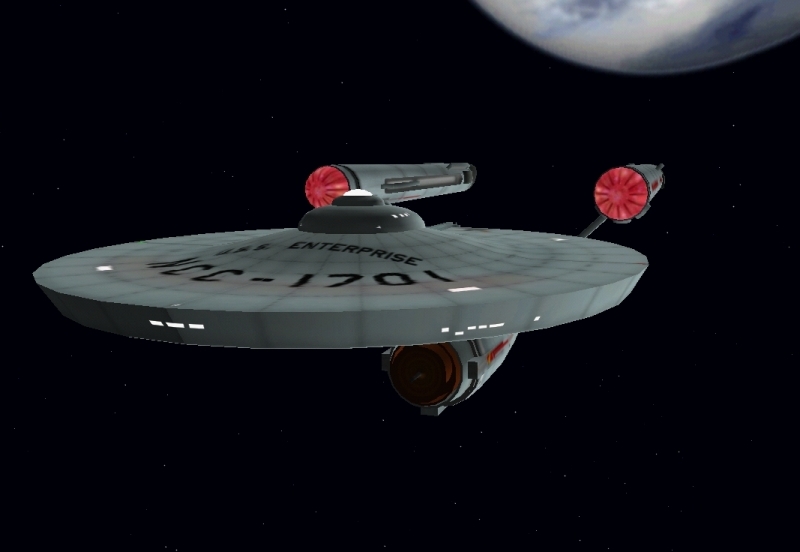 I finally redid those stupid looking warp nacelle dome textures on the TOS Enterprise, and remodeled it to fix the bugs. I'm also in the middle of remodeling my Enterprise-E again to reduce the hideously high facecount it had, and I'm still working on finding a way to do all the nice texture detail I want to put in. 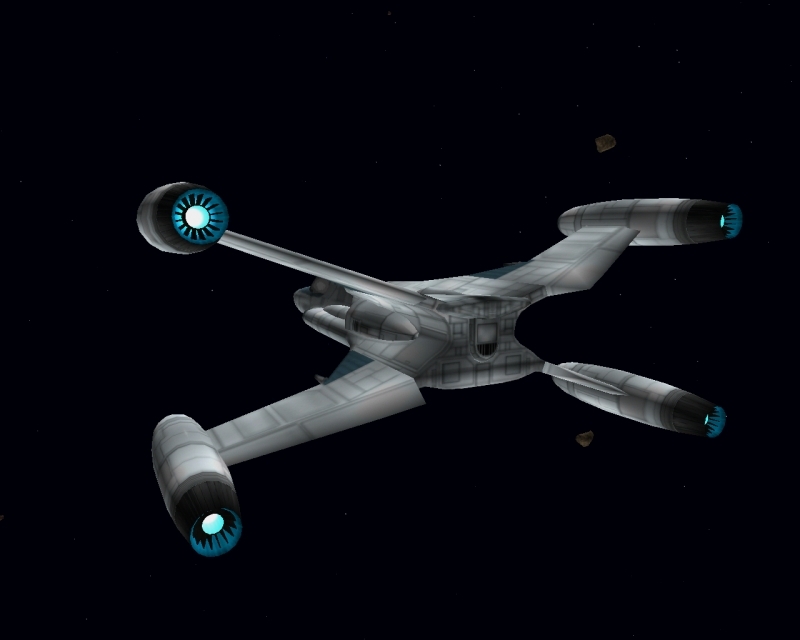 On another note, I've been looking for good photos, and I think I've got a decent amount of material together to start work on a nice model of the Gunstar from The Last Starfighter. It'll be a summer thing. I've also received a request by email to release the chrome-looking version of the Cobra shown above.. I don't know about a separate version, but maybe I'll make it a flightgroup color... Any opinions you have would be gladly appreciated (hint-hint- email me about it if you think it's a good idea). I also added this coolie little between page fade for fun. Found a web page that had it, and looked up the code to do it. Summer's approaching, and I'm ready for some serious opt work..One more week till schools out...so check back soon, and I may have a few surprises. Yeah, I'd say so. Sorry for the long nothingness, but I've been busy with real life, among other things. I have gotten a lot done though, and I'll post a few pics here as peeks at what I've been doing. 2. I did a little research, and am now convinced that whatever research was done to make the Enterprise-E model kit was done within 1 viewing of the movie. 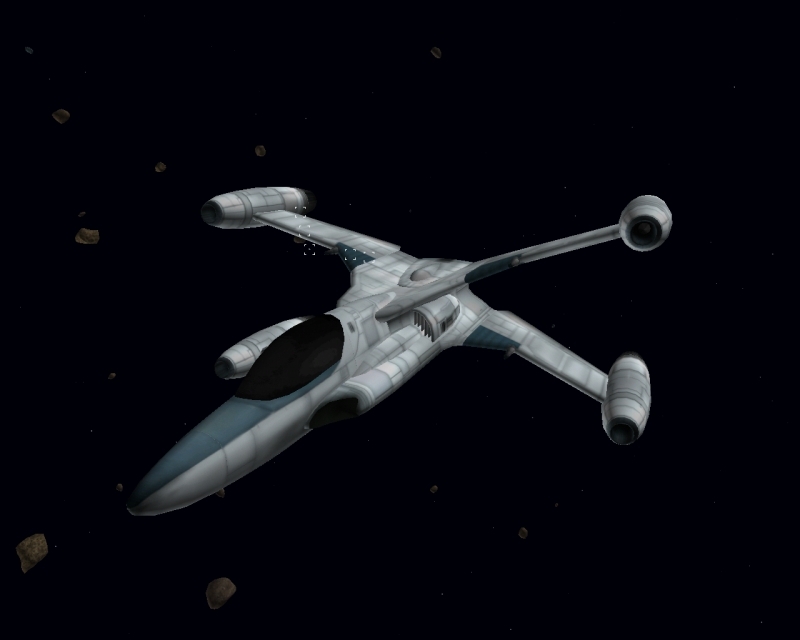 So I've scrapped the old textures, and am starting over again, this time using only photos, and the superb work of Totally Games as a reference (they did their homework with the Sovereign class textures in Bridge Commander). I'll post pictures of the new textures soon. 3. I've got new hull textures done for the new Cobra Fighter pretty much done, using some bump mapping tools I learned how to use.. The effect is pretty impressive, I'd say. 4. 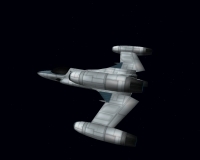 You know that pic of an untextured Hornet in the gallery section? Well, it's textured now. I've got the base model redone, and an entirely new exterior made. I just have to redo the cockpit, and fix the lighting bugs in the exterior. The Seafire Project is moving into its next stage. After flying several dozen skirmishes with the ship, I've noticed a few things that need to be fixed, like lighting bugs, and disappearing faces, etc. I'm going to revamp the whole opt, and go from the "prototype" into the full production model. The weapons and stats will be altered slightly, and I'm adding some more/better detail to some of the parts, as well as remeshing some parts to eliminate problems where meshes/faces cross. I'll be writing a background story for the new model soon, as well as renaming it (Seafire was meant to be a temporary name, much like the F-22 was called the "Lightning" for a while). I'll be working on this for a while, remodeling, textureing, and opting. When it's done, I'll release it and the new cockpit together. Well, I did it, I ditched CFM, and the Seafire is once again available for download. I'll get to work on finishing the cockpit soon. I've rearranged most of the site, and hope to eventually even have some decent tutorials for various things. 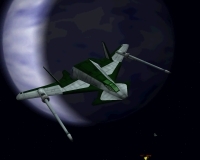 I'll be posting my older Wing Commander ships for download, as well as my Enterprises, as soon as I solve the lighting problems I've been having. BTW, if the little star icon by all the links is annoying, feel free to tell me, and I'll remove it. Anywho, I'll be moving my site soon, and am in the process of redesigning some of the formats, etc. I've just come into posession of an old version of Macromedia Dreamweaver, and editing my site is about to get a whole heck of a lot easier. I'm planning a load of improvements, such as actual downloads (whoopee!) and eventually will add the mother of all .opt tutorials: Opting For Mannequins (name still in debate- I wanna use "Dummies," but could upset some copyright people). I believe the first section will be called, "The Polygon is Your Friend." Don't expect it to be done any time soon though.. I probably won't be able to write it till summer.